"My best friend has left this world but we will be together..."
"My husband Thom and myself remember Pauline for her..."
"I'm so sorry for your loss. Thoughts and prayers for you..."
Pauline Adeline Roller, 94, a Clark County resident since 1970, passed away Oct. 16, 2015 in Battle Ground, WA. She was born Feb. 12, 1921 to Charles and Jessie Ragsdale in Abilene, TX, graduating from Chino High School (California) in 1939. Pauline briefly owned her own beauty shop in California and was a lifelong homemaker. 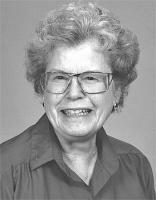 She was a member of Trinity Baptist Church in Vancouver, WA. Pauline traveled around the world as a volunteer travel hostess at the Luepke Senior Center for 10 years, led church services in nursing homes for 30 years, and volunteered as a teachers aid in her son's elementary classroom where he taught. Pauline was a woman of prayer and enjoyed reading the Bible (her favorite book), sewing, and ceramics. Pauline is survived by her children, Chuck (Sue) Roller, Jim (Linda) Roller, and Ed (Karin) Roller; "daughter", Anna Roller; six grandchildren; and 18 great-grandchildren. She was preceded in death by her husbands, George Roller in 1972 and Arnott Clark in 1994. A memorial service will be held on Wed., Oct. 28th at 2p.m. at Trinity Baptist Church. A private family graveside service will be held at Willamette National Cemetery. Donations may be made to Gideon's International. Special thanks to the Palamaryak family of Sequoia Meadows III Adult Family Home for all their care.